This powerful serum is a nutritional cocktail for your skin. Ferulic Acid combines with 20% Vitamin C (L-ascorbic acid), 5% Vitamin E (tocopherol), Vitamin B5 (pantothenic acid) plus Niacinamide to create a synergistic effect: the total effectiveness of this combination of ingredients is much more powerful than if each ingredient was used alone. If you have problems with dark patchy skin, post-inflammatory hyperpigmentation and melasma, this combination serum combines the perfect cocktail of ingredients to synergistically achieve excellent results – visibly and quickly. Ferulic Acid stabilizes vitamin C and also doubles the effectiveness of both vitamin C and E. On its own, ferulic acid helps to regulate cellular metabolism and prevent premature aging due to oxidation, especially when caused by UV radiation. Niacinamide lightens and brightens the skin. Also know as Vitamin B3, niacinamide prevents the skin cells that create melanin from transferring the darker pigment to the surface of the skin where unsightly darker spots appear. The result is an overall lightening and brightening effect. Niacinamide also stimulates skin to maintain its proper lipid barrier thus keeping irritants out. The result is a significant reduction in redness and flaring inflammation. Vitamin B5 helps with tissue repair and keeps skin hydrated. Vitamins C AND E provide powerful antioxidant protection against UV radiation. Additionally, vitamin C stimulates collagen synthesis and limits melanocyte production to help clear away age spots and post-inflammatory hyperpigmentation caused by old blemishes. For more information on which serum is better for your skin issue, vitamin C+ Firming serum or F*a*C*E Synergy serum, see Dr Glow Girl’s Blog post here. Apply twice a day, morning and night. Allow to dry. If skin is sensitive, apply either Calming BioLipid Repair Creme or Calming BioLipid Repair Fluid. KEEP TIGHTLY CAPPED IN REFRIGERATOR. Do not subject to temperatures above 80 degrees F.
Use CSRx Polishing Grains first to increase penetration of the serum. 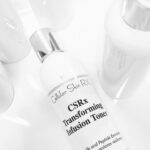 Apply CSRx Antioxidant Defense Complex under F*a*C*E Synergy Serum to help achieve faster lightening and brightening results. Always use sunscreen to maintain results and reduce melanin stimulation. Keep product in a dark cool place, preferably a refrigerator. I’m African American and was having issues with dark spots on my arms. I talked to Patricia at Cellular Skin Rx a few times about how to lighten the spots up. She recommended the FACE Synergy Serum and though I was skeptical (my doc told me only lasering would help), I’ve been using the serum for a few weeks and even my daughter noticed that the spots have lightened up quite a bit. Thanks to Patricia and for making such a great serum. I feel much more confident about showing my arms now. Here in Thailand it is hard to get rid of bad spots from acne and sun. This serum helped to clear up the spots quickly. Ferulic Acid is very good but sometimes a high price. Not this serum. Thanks! I read that Ferulic Acid and Niacinamide and Vitamin C were the best ingredients for aging skin in a magazine and then looked them up online. I came across the Cellular Skin Rx website and decided to try the FaCE serum (after seeing that Skincuticals was about 180 bucks). I am glad I did. 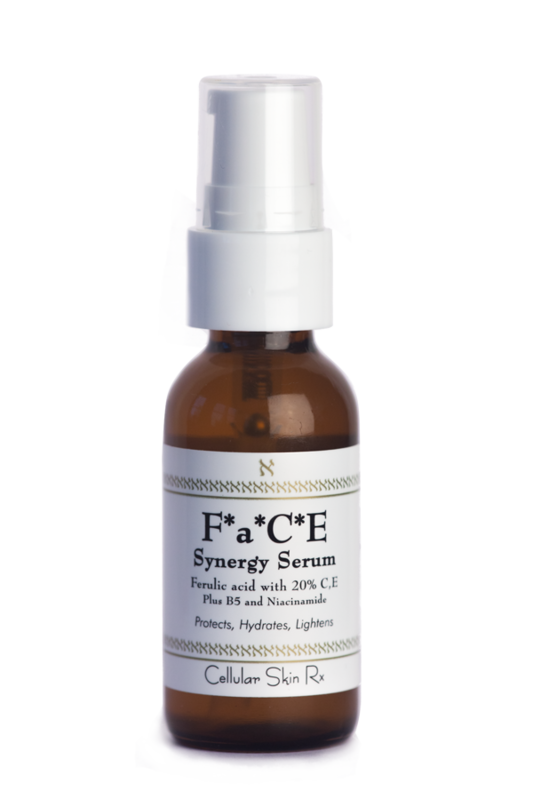 This is a good serum that has brightened up my skin and completely erased all the fine lines I was getting (at 48 years old). It’s not expensive either.